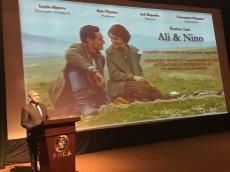 With the organizational support of the Azerbaijani Embassy in Pakistan, "Ali and Nino" movie was premiered in Islamabad. The ceremony taken place in the hall of the Pakistan National Arts Council was attended by the Acting Foreign Secretary Aitzaz Ahmed, representatives of the local community, foreign embassies operating in Pakistan, media, artists and students, Azertac reported. Addressing the event, Azerbaijan’s Ambassador to Pakistan Ali Alizade said that the film was shot on the initiative and with the support of Vice President of the Heydar Aliyev Foundation Leyla Aliyeva, who is also the executive producer of the film. Ambassador said that the film tells about the struggle of Azerbaijan for independence and the establishment of the first Azerbaijan Democratic Republic in 1918. In his speech, Aitzaz Ahmed stressed friendly and deep relations Azerbaijan and Pakistan. He said that over the past 26 years, Azerbaijan has grown significantly in the political, economic, social and cultural spheres. Further, the premiere of the film took place, which was watched by the audience with a great interest. "Ali and Nino" was first screened January 27, 2016 at the Sundance film festival.